High relief coins have a design that projects outward from a flat surface. The designs are raised instead of being flat, making high relief coins more like sculptures than traditional coins. Coins minted for circulation need to have the ability to stack on top of each other. Conversely, high relief coins that are struck with no intention of ever being used in commerce can be more intricately designed. President Roosevelt made it an initiative of his to beautify American coins. This beautification process began with the Saint-Gaudens Double Eagle. The idea was to have coins designed in high relief that rivaled the gold coins of the ancient Greeks. The Saint-Gaudens Double Eagle is still considered one of the most, if not the most beautiful coin in the history of American coinage. Many things have changed since the days of the Saint-Gaudens Double Eagle including how the high-relief coins are minted. With new digital dies and high tech presses, coins can be minted with detail that was never before possible. The exquisite detail of the high relief coins make investing and collecting these coins more enjoyable than ever before. The 2017 American Liberty 225th Anniversary Gold Coin commemorates the 225th anniversary of the United States Mint with a progressive depiction of Lady Liberty. Lady Liberty has graced American coins for the entire 225 year existence of the United States Mint. The newest Lady Liberty is a modern interpretation of the symbolic figure that has been used to exemplify the ideals bestowed in the United States Constitution. These beautiful proof coins feature raised edge lettering and are minted using .9999 24 karat gold in high relief. Lady Liberty is featured on the obverse of the coin wearing a crown of stars. Also included on the obverse of the coin is the inscriptions "LIBERTY," "IN GOD WE TRUST," and the dates "1792" and "2017." The reverse includes a majestic eagle in flight with "UNITED STATES OF AMERICA" and "E PLURIBUS UNUM" along with the coins weight, fineness, and face value. The 2015 American Liberty High Relief Gold Coin features the latest and greatest in digital technology from the U.S. Mint. The $100 face value matches the 1oz Platinum American Eagle and represents the highest denomination ever issued on a gold coin in the United States! The U.S. Mint fulfilled renowned sculptor Augustus Saint-Gaudens’ original vision of an ultra high relief double eagle gold coin with the release of the 2009 Ultra High Relief Double Eagle Gold Coin, closing one era of classic American coin design and ushering in a new one. The High Relief effect is achieved by using a thicker coin and a smaller diameter, allowing for the background of the coin to be concave and giving the portraits and features a raised, more realistic design. United States Mint Artistic Infusion Program artist Justin Kunz created a stunning new interpretation of Lady Liberty gracing the $100 Liberty 24-karat gold coin, along with a contemporary design depicting an American eagle rising in flight, gripping a branch in its talons as an embodiment of freedom. Containing one troy ounce of .9999 fine 24-karat gold, these lustrous high relief coins are among the world's purest gold coins making them a treasured addition to any collection or investment portfolio. The U.S. Mint announced the plan for the Ultra High Relief in March 2008 and it immediately raised high interest in the gold investment community. The coin was released for public sale the following year and it quickly sold out at the Mint, as investors acquired every coin they could get their hands on. In the following years, demand for the coin has steadily increased, but the supply stays the same, which has driven a consistent increase in the price, making early buyers very happy in the process. Even with the sharp increase in value, there are very few of these coins available in perfect "Mint State 70" condition on the market. All 2009 Ultra High Relief coins are certified in perfect condition and are sealed in a tamper-proof holder to guarantee and preserve the condition. The coin pays homage to famed mint engraver Augustus Saint Gaudens, who created the legendary Liberty Head Double Eagle, including the 1907 High Relief Double Eagle. The first 2009 Ultra High Relief coin that was made was sent immediately for safekeeping at the Smithsonian Museum. The second coin was preserved by the U.S. Mint to add to its heritage collection. The special one-year issue coins are struck in solid 24-karat gold on 27 millimeter blanks that are 4 millimeters thick. The Ultra-High Relief coins contain one full ounce of .9999 fine gold and required two strikings of the coin press at a pressure of 65 metric tons to fully bring up the high-relief detail..
Certified coins in perfect MS70 or PF70 condition are considered actual "museum-quality." With their flawless finish, perfect condition and rarity, they are preferred by both collectors and investors. Since they are true collectibles, they are not as subject to the ups and downs of the commodities market, which has made their value more stable over time than gold bullion alone. 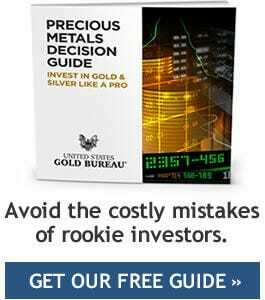 The U.S. Gold Bureau recommends these coins as a long-term store of value, to help protect your portfolio from turbulent economic times.